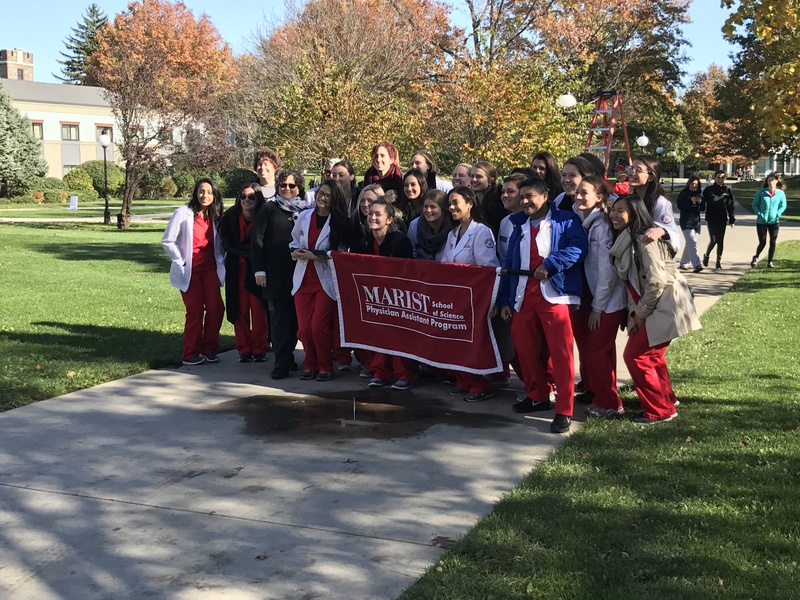 POUGHKEEPSIE, N.Y. – One of Marist College’s signature annual campus events was once again a huge success. On Wednesday, Nov. 8, Marist held its annual Hunger Walk in an effort to both raise awareness about the issue of hunger in the community, and raise money for several hunger relief organizations including Bread for the World and Dutchess Outreach. The event was organized primarily by Marist Campus Ministry and the Marist Honors Program. Those participating in the walk conglomerated for pictures on the Champagnat Green at approximately noon and the walk eventually commenced at about 12:30. Despite the windy conditions, each club, organization and sports team that participated in the walk was able to display its own banner as they walked. Participants included nearly every sports team, greek life, freshmen dorms and the Marist Student Government Association. Each individual who participated in the walk made a donation of their choice to the cause. According to Brother Michael Flanigan, 853 people participated in the walk. Every year, Marist declares the month of November “Hunger Month”. The Hunger Walk is only one of several events that Marist puts together throughout the month in order to raise awareness and fight the issue of hunger. Other events that take place throughout the month include a campus-wide food drive and a Hunger meal, which is an “educational” meal intended to demonstrate the distribution of wealth and food. The exact amount of years that the Hunger Walk has taken place is unknown. However, according to Flanigan, it has been going on for at least 22 years. The rate of participation each year has been consistent at around 800 students on average. Four years ago marked the Hunger Walk’s largest ever turnout at over 900 participants. Marist has taken great pride in its ability to bring awareness to the issue each year. Although the walk itself is a great component to the college’s fight against hunger, it is the message that comes from the month’s events that is the most important. “The walk itself isn’t what fights the hunger, but it’s the awareness, it’s the month, it’s the canned food drive around campus, it’s the donations today, so it’s a great thing and we love to be here,” Marotti said. The amount of money raised from this year’s hunger walk has not yet been calculated. However, with another strong turnout, the final donation tally will likely reflect another successful walk against hunger. This entry was posted in Health and Wellness, On Campus. Bookmark the permalink.